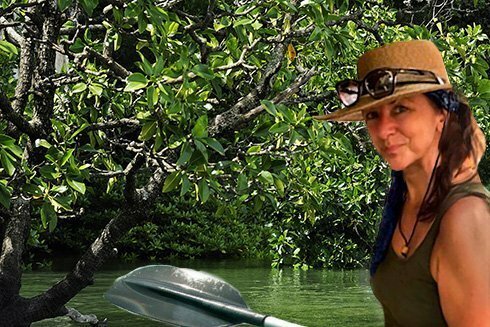 Paddle through mangrove forests, lagoon waters and sea tides. Search for surface swirls fashioned by manatees or dolphins, cormorants or turtles. Peacefully navigate the Indian River Lagoon’s passage and enjoy Florida’s brilliant feathered friends awaiting your arrival. Visit sea-shelled beaches that delight with teasing waves. Learn about sea turtles and rare birds that nest on Florida’s beaches. See what the waves uncover, and bring to your feet. Embark on a Beach Discovery and take home the memories. … Did you hear that? Was that a sandhill crane announcing its arrival? Take a stroll and hopefully see a grazing gopher tortoise or a scrub jay patrolling its territory. Look in the dirt! Those look like cat tracks; bobcat that is, are they fresh? Around town there magic too. Is that a Great Horned Owl I see on the telephone pole? Are those Wood Storks in that retention pond? What about these roosters!? Get outside and breathe in the salt & sun-drenched Florida air. Feel the wind on your face and the earth on your feet. Feel your Soul. Escape the noise of technology and watch the clouds. Hear the birds sing, and drink in the scents wildflower blooms. Flee your daily distractions while enjoying your journey on nature’s pathway, for nature is everywhere. Nature is Us. It’s not about what you do when you go outside. And it’s not about where you go. It’s about seeing with deep respect & a desire to connect, regardless of what shows up … see it, smell it, feel it. Indigenous people all around the world have teachings that evoke this humble attitude of respect and timelessness towards nature. And, if you paddle in the Lagoon, there will be sharp oysters so you will want to purchase some close toed water shoes. An old pair of close toed sneakers will also do. Just be prepared for them to be wet and, most likely, muddy. You should bring plenty of water, and snacks. A hat, sunscreen and sunglasses are highly recommended in the Florida sun. A life-vest must be on board as well as a whistle or other sound devise.